Dupaco Community Credit Union garnered the Dubuque Chamber of Commerce Members Choice Award for Business of the Year. 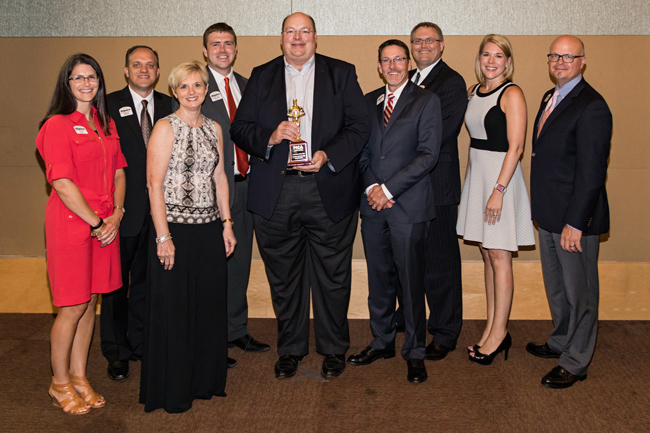 The credit union was recognized during the chamber's annual dinner last week. The Business of the Year Award shows "outstanding leadership, long-standing contribution to our business community, and demonstrates significant community efforts," according to the chamber. "They reflect growth and achievement, innovation, creativity and engagement. With advanced technology and talented workforce, Dupaco is no stranger when it comes to what every business would like to be." 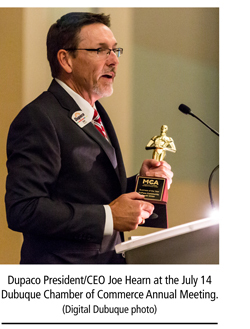 Dupaco President and CEO Joe Hearn said the award confirmed the cooperative's commitment to its more than 91,000 members and sent a message to the credit union’s 385 employees that their work makes a difference. Digger Kurt, Randy Skemp, Joe Hearn, Todd Link, Danielle Gratton, and David Klavitter.